Drow: “Time to hit it with the “Finger of Death.”! Congrats to our winner Spectre615 who created the above caption! Be sure to check out the fully captioned version on d20Monkey.com as well. Alright everybody, here’s the strip for July! Submit your captions, thought/word bubbles below in the comments and may the hilarity ensue! 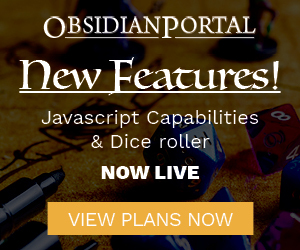 Remember if you’re chosen you get 3 months of Ascendant time, an Obsidian Portal T-Shirt and your comic will get posted on d20Monkey for all the world to see!